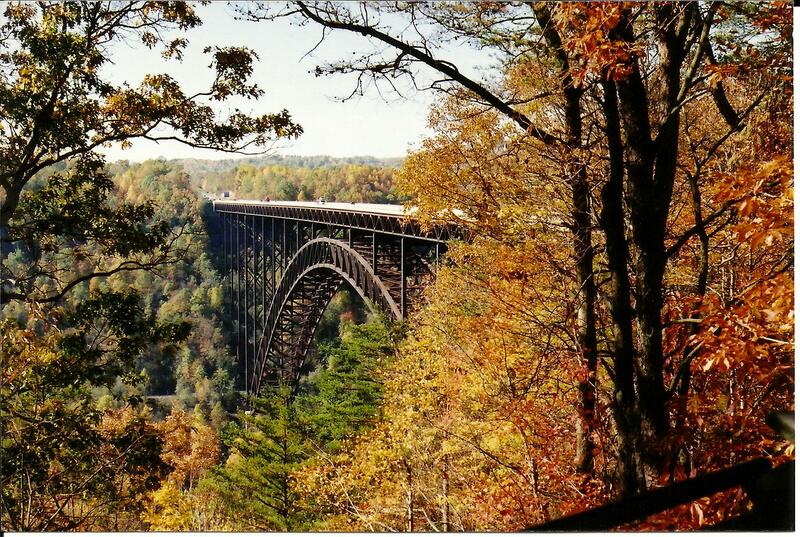 My family traveled to Bridge Day for the frist time last year and I have been wanting to go back all summer.The weekend of Oct. 19 we are all headed back to Fayette County West Virginia for the biggest festival in our state. The things that are so appealing about this festival are the time of year, the low-cost, the experience of being able to walk on the second largest arch bridges in the world and cheering on BASE jumpers who for one day every year have legal rights to jump off the bridge and hope to land safely in the gorge below. 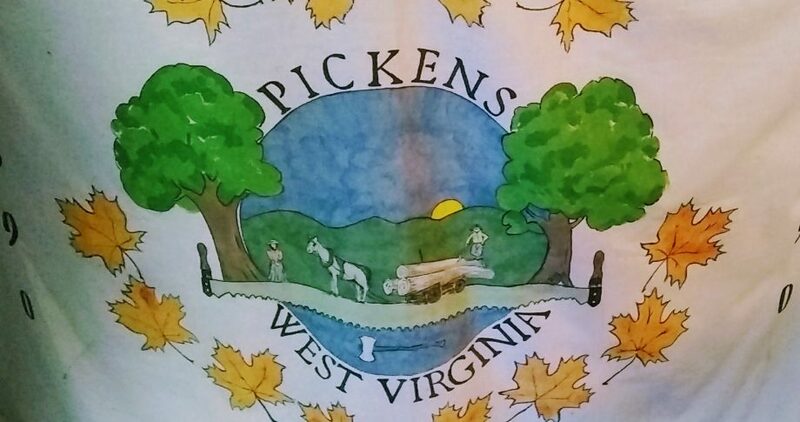 My family travelled to Fayetteville, West Virginia for the festival and my 43 birthday. The trip took us about 2 hours from my home in the central part of the state. 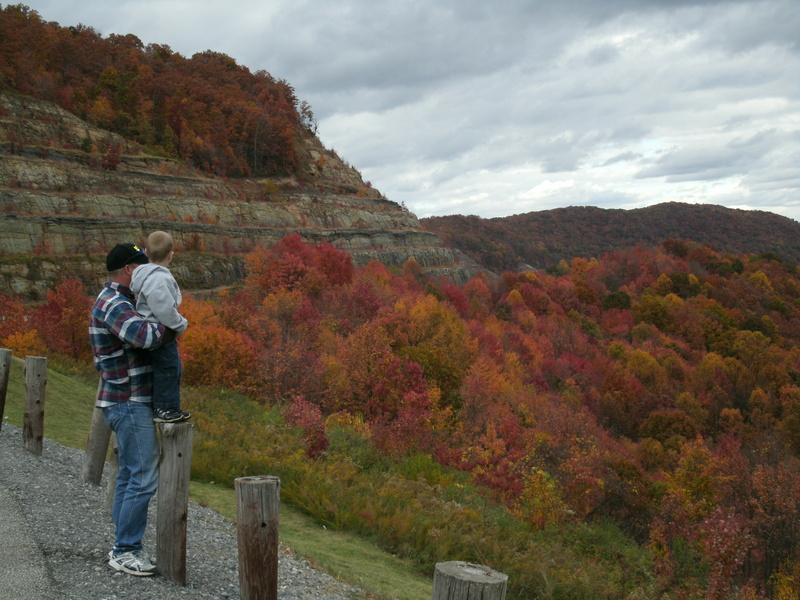 This is the most beautiful time to travel in West Virginia, as mid Oct is the height of the leaf color. The views along the interstate 79 south and Highway 19 were breath-taking. I made Tom stop the car several times to take photos along the way back. When you arrive to the Bridge there are several places that the park uses for parking the cars of the 80,000… spectators they had in 2012. Most are campgrounds or churches. From these make shift parking lots the park service employees load you on school buses and takes you out to the end of the bridge for a reasonable fare of $2 dollars a rider, kids under 6 are free. This 2$ fee is the only fee charged the whole time you are at the festival unless you choose to buy something. As you step off the bus the amount of people who are walking the bridge is then visible. Personally have never seen this many people at one place at one time before. I was over whelmed but never really felt closed-in unless you were at the back of the launch stand where the BASE jumpers were diving off the bridge. 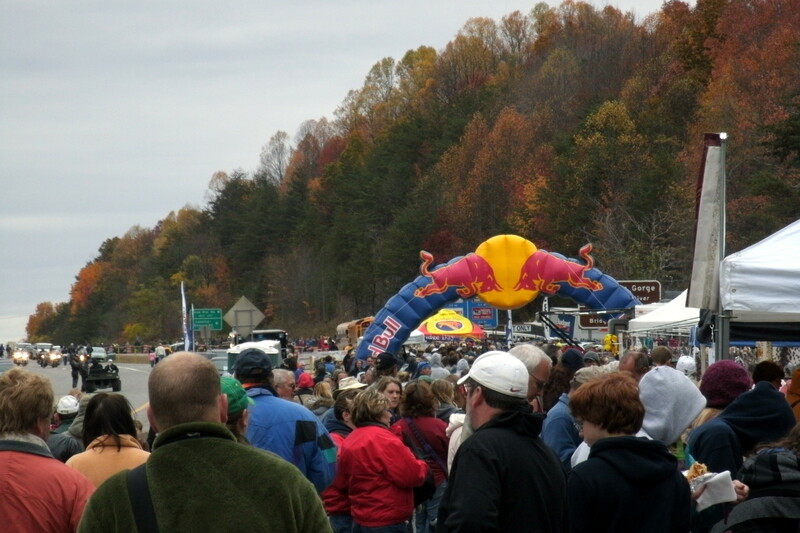 Once we passed under the “Red Bull” arch the crowds thinned out and walking in groups was very easy. Then you start out over the gorge and my heart pounded and I was so excited to finally get the chance to look down over the edge of my favorite bridge.OK, I do have a real soft spot for bridges and this one is my favorite by far. This is the view from the top of the bridge to show you what we were seeing. Christopher’s head is in this photo as he LOVED watching the jumpers canapes open with the beautiful colors drifting down. 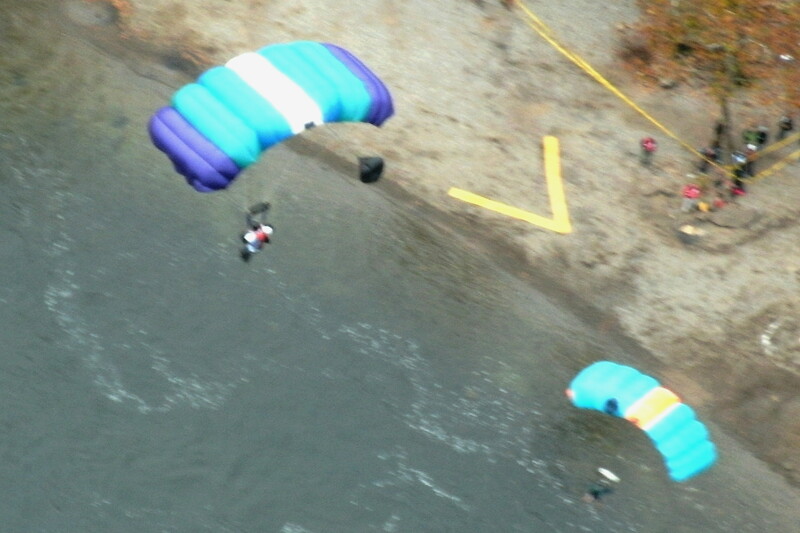 The photo below shows two jumpers almost ready to land. The BASE jumping begins at about 11am and we had arrived about 10am so the kids and I began to explore the venders at each end of the bridge. They have no services on the bridge itself so if you want food or a restroom you end up walking the length of the bridge ( .57 mile long) to get a hot polish sausage or lemonade. 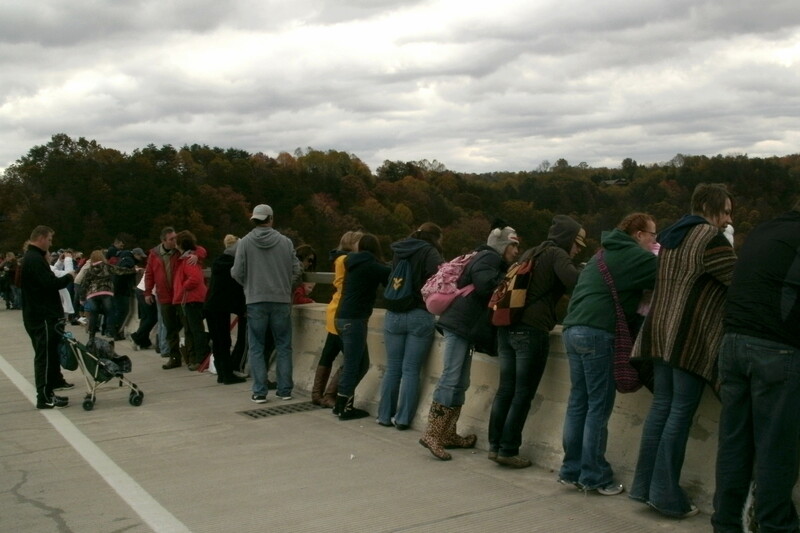 Then we headed back on the main body of the bridge to see the jumpers… This was my view most of the remainder of the day. The 400 BASE Jumpers wrap up their day around 3pm and we watched the very last jumpers go over the bridges edge in a set of three jumpers. It was a beautiful to see and insightful to see who and why people jump. Some of the jumpers are doing the jump in memory of lost loved ones. Some do it for pay…..”RED BULL” …extreme sports team is always their with music and head cameras going as jumpers film them selves flinging off the edge in a human catapult. Others are trying to have a great life and just enjoy the thrill of it. The oldest jumper last year was a man in his 80’s who just charmed the crowd with his presence. 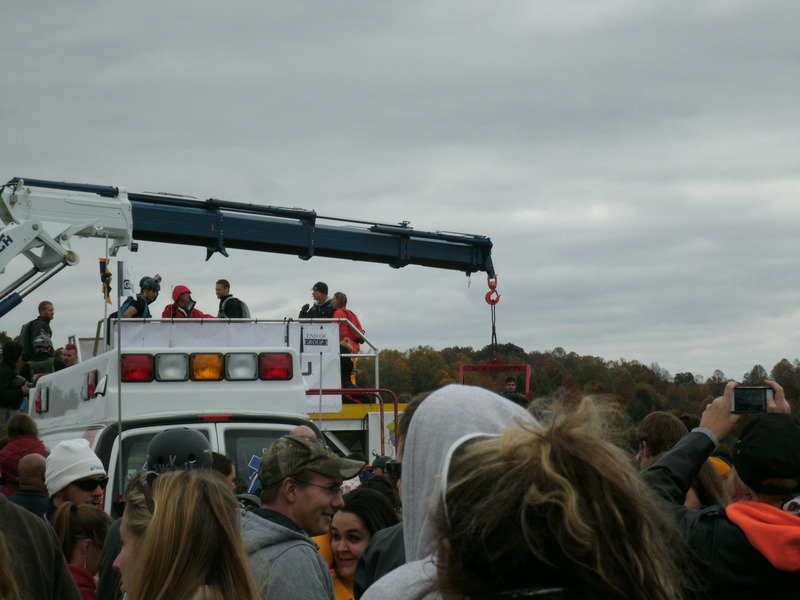 The link below is of the Human Catapult at the 2012 Bridge day event the frist time the festival used it. Below is a photo of the rig used to let the jumpers leap from the bridge. 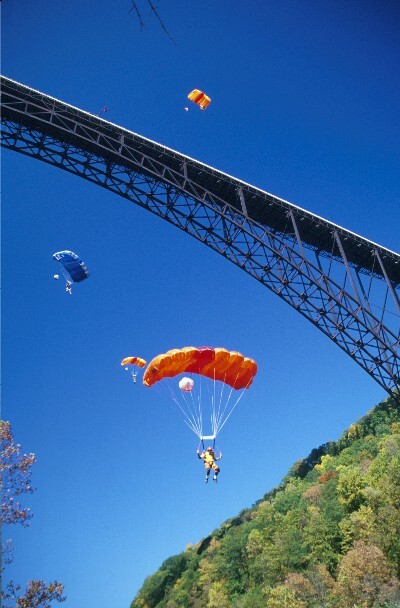 Their at also other activities going on before during and after the main event of Base jumping so it is wise to plan ahead and use the official “Bridge Day” website to get more information on times and hotel information if you want to make it a weekend event. and for other activities that happen at and around the New River or the Bridge contact adventure travel.Thier web site includes information about white water rafting and rappelling from the bridge. As our day slowly came to a close I wanted to take a few photos on the bridge with my family as a nice reminder of one of the best birthdays I have ever had. 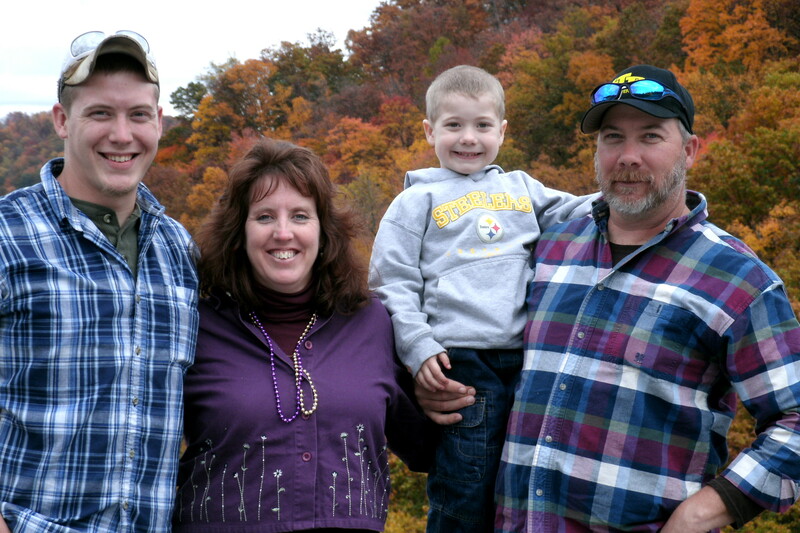 I was able to get some great family photos that day as it the weather was a cool 53 degrees and over cast. 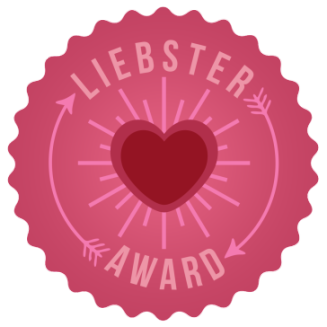 I loved it because everyone looks better with rosy cheeks. 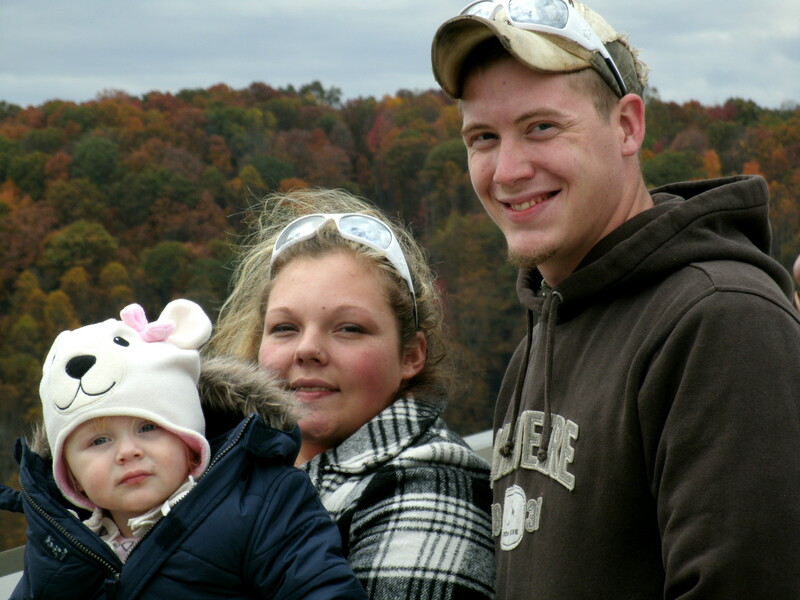 and I got a wonderful photo of my grand-daughter and sons wife that day too! We then walked back across the Bridge the other 3,030 feet (.57 of mileage) to the bus pick up location. We had eaten wonderful hot food and kettle corn, gotten free bead necklaces, herd rock music and talked to people from all over the country and Europe. This is the most widely watched extreme sport in the united states and is the best tank of gas and 2$ I have ever spent. It is well worth the trip to see and share in all the fun and was a great way to celebrate me just getting another year older. As a side note, none of the jumpers were injured or killed at this years festival but as a warning to anyone who wants to attend. 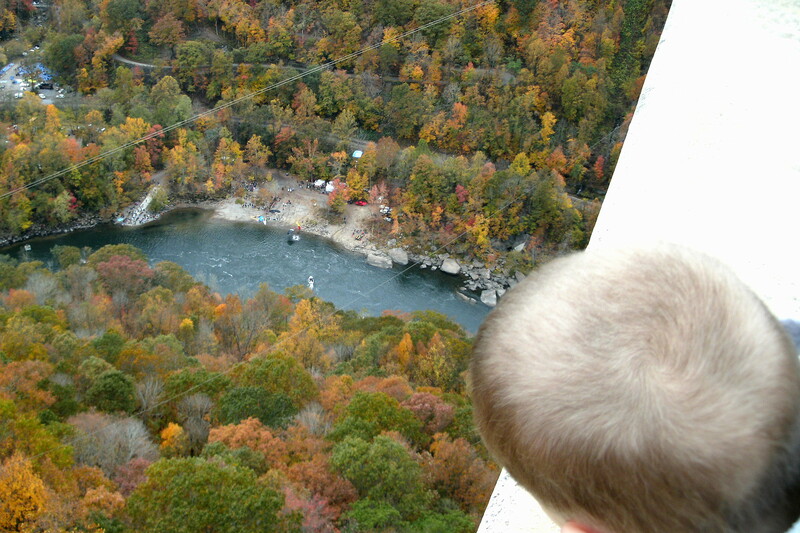 People have been seriously injured or killed at this event and many of the jumpers land in the ice-cold water bellow. So remember that it is possible that you may witness some thing that goes wrong and have to leave the area so that emergency personnel can have access to the bridge or surrounding areas. Again it is a wonderful event and at the perfect time of year so enjoy the 2013 Bridge Day on Saturday Oct 19 and watch some thing amazing.